If the rumored plot details about the film are to be believed, then Luke Skywalker will be turned into a rather mysterious character in J.J. Abrams' Star Wars: Episode VII. Reports have said that the Jedi hero completely disappeared after the Battle of Endor featured in Star Wars Episode VI: Return of the Jedi, and hasn't been seen since. It's hard to say what this will mean for actor Mark Hamill's presence in the December 2015 blockbuster, but if it's kept to a minimum we should probably cherish every sight we see of him. Which is why we're all too happy to have the photo above of Hamill standing on the Star Wars set. You may have already guessed that Nathan Hamill is Mark Hamill's son, but if you're still confused about Lava Bear, I'm happy to explain. The photo originally comes from Nathan Hamill's personal website, which features photos taken around the world with a little figurine called "Lava Bear." Now you're all caught up! After a two week long hiatus that was scheduled due to Harrison Ford's on-set injury, Star Wars: Episode VII is starting to get back to work and will presumably will be continuing to film for at least a couple more weeks. 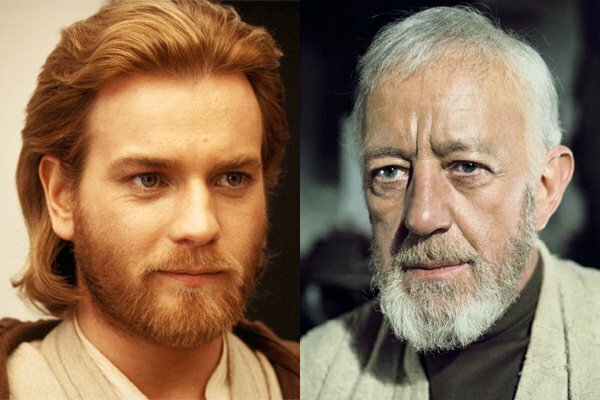 In addition to Hamill and Ford, the sci-fi epic has a stacked cast of returning veterans - including Carrie Fisher, Anthony Daniels, Peter Mayhew, and Kenny Baker - and a ton of new faces - like John Boyega, Daisy Ridley, Adam Driver, Oscar Isaac, Andy Serkis, Domhnall Gleeson, Lupita Nyong'o, Crystal Clarke, Pip Anderson, Christina Chong, Gwendoline Christie and Max von Sydow. There's surely still a lot of work to be done, but if the reps at Disney can be believed, then the film is still on target for its release date on December 18, 2015.